Blogger and writer who enjoys a good read. You'll find me in Manchester or London in a coffee shop or wine bar. At Christmas, there's no need for any excuse to get stuck in to some tasty food and drink – or to do a bit of shopping. Thankfully, Christmas markets give us that excuse anyway! They are both a celebration of the festive season and a chance to prepare for it, with stalls selling everything from gifts and decorations to hot drinks and snacks, as well as craft items and warm clothing. Here are my picks of the best markets in Manchester. This international-themed market is the main event in Manchester, so it definitely has to get a nod. You can tell by the name that they aren't really expecting any competition! There's a real German emphasis here, coming from the fact that the best Christmas markets originated in Germany. You can buy bratwurst, drink the German answer to mulled wine, and enjoy lots of handcrafts which come from the region. On top of that, though, you can expect French soaps, Spanish paella, hog roasts, and all kinds of other international flavours. Head to Albert Square to enjoy it. There is definitely an international theme here, too – mostly because of the various restaurants and food stalls that populate the area bringing their own flavours to the market. From Italy to Holland via Greece, you'll find halloumi fries, macarons, and deli items waiting to be snapped up by any hungry visitors. Oh, and there is set to be some interesting woodwork and crafting on display as well, just in case your interest in Christmas markets goes beyond the food being served! One of the main attractions at St Ann's this year will be a VW Campervan which has been converted into a photobooth – perfect for all those Instagram moments with your friends or loved ones. Meanwhile, Anja's Bar nearby is doing a special sale of décor items which are themed around the Manchester Bee. It's worth taking a look, even if only for the promise of being able to get your photo printed onto a number plate. 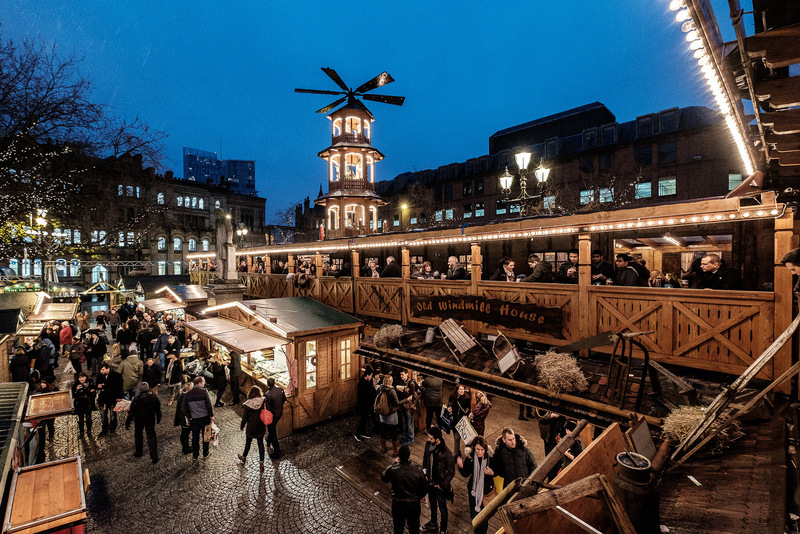 One of the interesting things you'll find is that each of the different Manchester Christmas markets has their own signature food. Sometimes it's just a normal food you could buy any time of year, and other times they like to get a bit creative. Back again this year after being a success last year are Yorkshire Pudding wraps. I tried one but I just don't think I can do it justice with words, so you'll have to try one yourself if you want an idea of what this odd food is like. The big draw here will be the Arctic Bar. You can see frozen barrels, ice sculptures, and lots of festive drinks and cocktails served over ice. There's also a rink in place which means you can go for a skate either before or after you enjoy the market stalls, making this a clear winter classic. If you have a family, you'll also want to stop by Santa's Grotto! It's fair to say that each of the Christmas markets in Manchester has its own appeal. Some of them have more stalls and variety to choose from, while some of them are a bit quieter and perhaps more peaceful for families. Each of them is clearly heavily influenced by the location in which they are set, which makes for some really interesting browsing as you walk amongst the stalls!